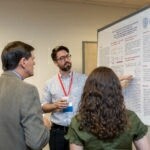 The Scientific Advisory Board of The Children’s Cancer Foundation, Inc. (CCF) invites investigators, trainees, graduate students and others doing research on topics relevant to childhood cancers in the Maryland, D.C. or N. Virginia area to submit a one-page abstract to be considered the 4th Annual CCF Research Symposium. Click here for Abstract Guidelines. Deadline is 11:59 EST March 4, 2019. Submitting an abstract from a recent research conference is acceptable. The CCF Research Symposium brings together regional experts, advocates, survivors and trainees to share research and continue to advance the treatment of childhood cancer. 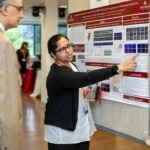 Approximately 30 abstracts will be selected for a poster presentation and a few for a short oral presentation. Notification of selected abstracts will be in early April. For questions and abstract submission: info@childrenscancerfoundation.org or 443-546-4479. 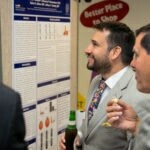 Wednesday, June 5, 2019 — 9:00 a.m. – 5:00 p.m.
PhD Candidate Garrett Graham of Georgetown discusses his research during the poster session. Saravana Selvanathan, Ph.D., Georgetown Lombardi Comprehensive Cancer Center discusses his research. 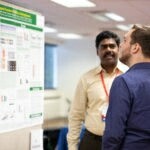 Other researchers discuss details of their research.